On September 28, the Supreme Court (SC) of India passed a verdict saying that women of menstruating age can now enter Lord Ayyappa's Sabarimala temple. This temple of Lord Ayyappa, who is believed to be celibate, had barred entry of women of menstruating age since the past many decades. The order was implemented on 17 October. But not a single woman could enter the temple due to angry devotees and protestors. SC is all set to hear petitions that challenge the verdict on 13 November. Nineteen petitions have already been filed by various parties. 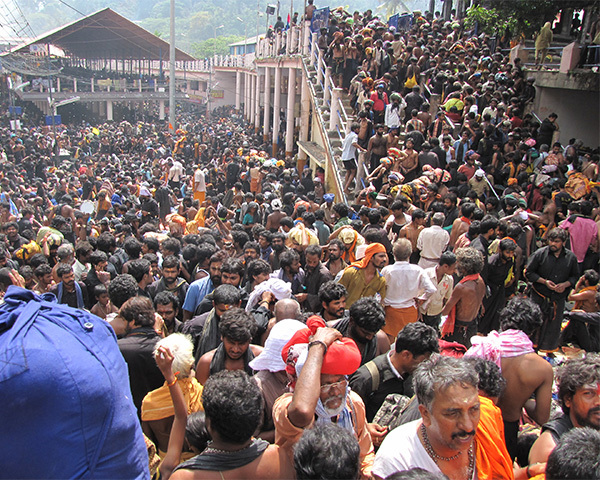 A few women and even news reporters who tried to enter the shrine were manhandled by an angry mob at Sabarimala. They were hurled abuses at and even pelted with stones. The thanthri shut down the main shrine and all the priests created a human barricade denying entry of women into the temple! Currently, Sabarimala is closed for its monthly 'puja'. BJP and Congress parties who are trying to get more votes for the upcoming elections have lend their support to agitators. The state government pointed out that most of the protestors at Sabarimala shrine are party workers who are there to create communal tiff. Kerala Chief Minister Pinarayi Vijayan criticised the Devaswom board, Pandalam Royal Family Trust and the thanthri of Sabarimala for denying entry of women. He said that none of these parties have the right to go against the order of the Supreme Court. He further added that if they violate the law, they will have to face the consequence as well. Vijayan stated that his communist party believes in equality of both men and women. Hence, the state government will ensure that they do all that they can to uphold the SC verdict of allowing women into the shrine.